The SQL LAG is one of the Analytic Function in SQL Server, which is exactly opposite to LEAD. 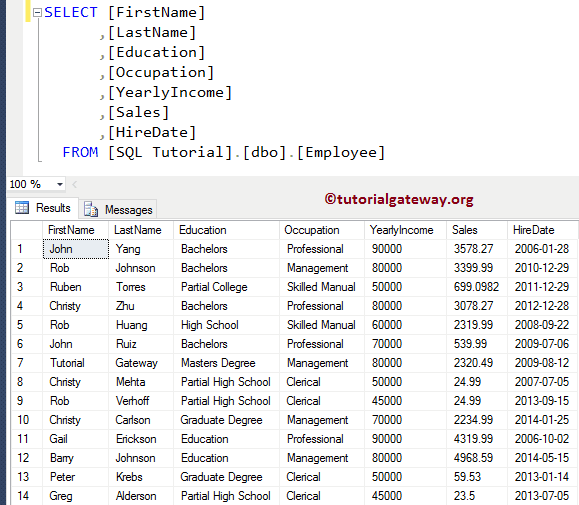 This function allows you to access the data from a previous row without using any SELF JOIN. Scalar Expression: It can be a Column, Subquery, or any exp that returns single value. Offset: Please specify the number of rows you want to move backward. For example, If it is 3 then it will select 3rd previous row (-3 row) as the result. 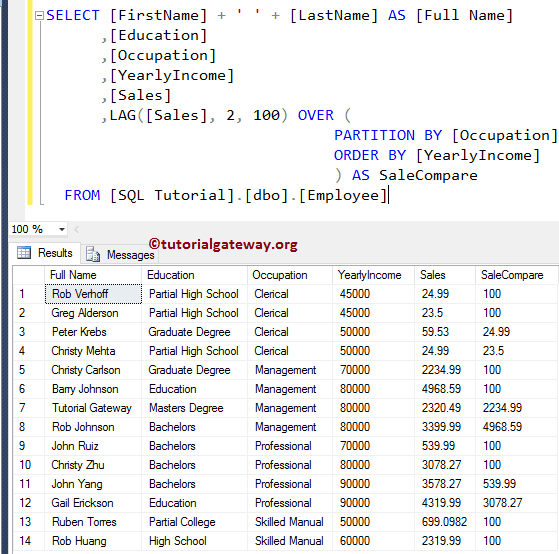 It can be a Column, Subquery, or any expression that returns single value. 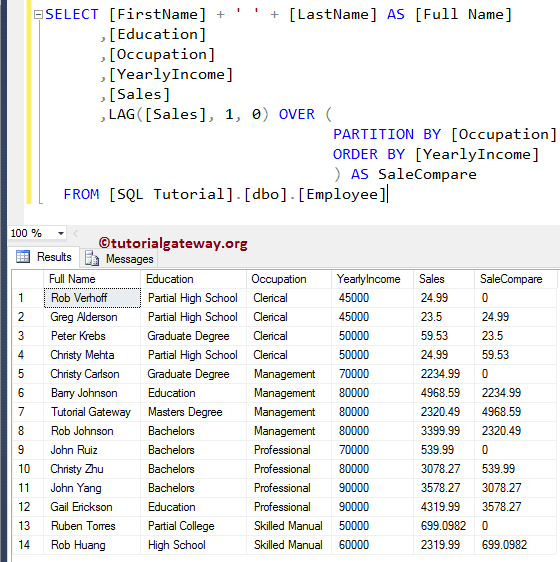 Partition_By_Clause: It divide the records selected by the SQL SELECT Statement into partitions. If you specified the Partition By Clause, then LAG Function will start selecting the previous rows in each partition. If you haven’t specified the Partition By, then Sql Server LAG Function will consider all rows as a single partition. 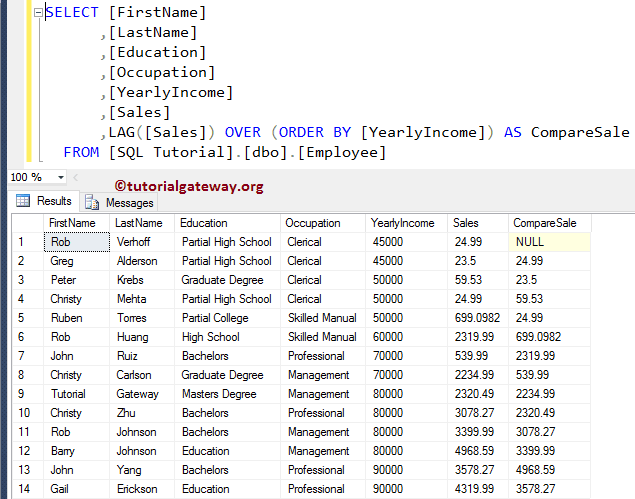 In this example we will show you, What will happen if we omit the Partition By Clause in the LAG Function in SQL server. In this Sql Server lag example we will show you, How to write the previous values from the partitioned records present in a table. 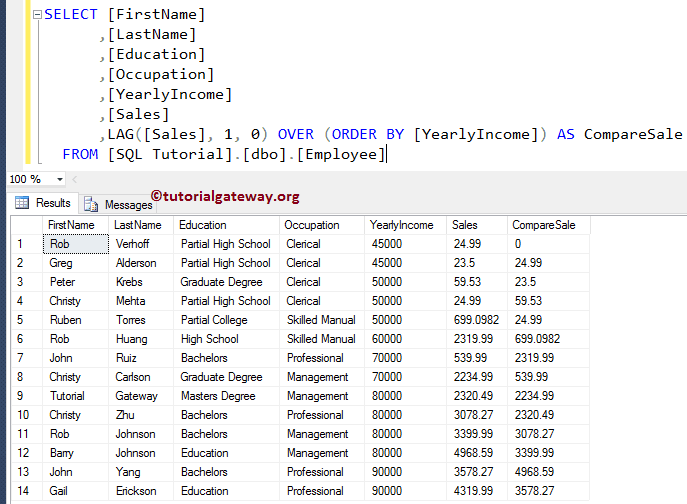 The following SQL Lag Query will partition the data by Occupation using their yearly Income, and then previous Sales values in each partition. From the above screenshot you can observe that, for the 1st, 5th, 9th, 13th row, SQL Lag function returns 0 as the output. This is because there is no previous records to select within that partition (All those records are first records with respect their partition). In the below statement we used SQL LAG Function with Partition by clause. It will select the previous rows with the individual partition. In this example we will show you, What will happen if we change the offset value in the SQL server LAG Function from 1 to 2, and the default value to 100. If you observe the above screenshot, Sql server lag function is selecting the -2nd row (2 rows ahead), rather than selecting the previous row. If you change the value to 3 then it will select the third previous row (-3rd row) by jumping previous two rows etc.